The global cycles of biologically active elements are an important part of basic and advanced Earth Science, Ecology and Biogeochemistry courses. An understanding of biogeochemical cycles and anthropogenic impacts on them is also fundamental in studies of global climate change. Unfortunately, most presentations of biogeochemical cycles occupy one of two extremes: they are either presented so simply that they contain information on pathways only, or in such detail that they defy comprehension and are us eful only to specialists. Further, most workers have specialized in facets of individual cycles, and broad perspectives and an understanding of interactions between cycles is lacking. The figures presented here are an attempt to fill the middle ground and allow comparisons between element cycles. Figures based on current literature values showing the global cycles of C, O, N, S, P, and Si, as well as H20 and CH4, are presented in a uniform format that shows pool or reservoir sizes, significant natural and anthropogenic transfers or fluxes between pools, and residence times estimated from the ratio of pool size and the major fluxes. The uniform format and use of color to distinguish pools, fluxes, and turnover times makes comprehension of individual element cycles and comparison between element cycles straightforward. 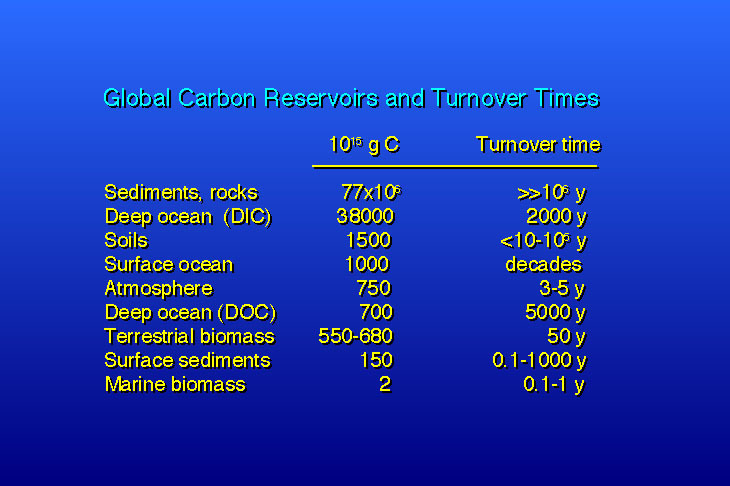 The figures were developed as class assignments in a graduate-level course in Earth Systems at the University of California Irvine and have been used in graduate as well as undergraduate courses. Discussion surrounding these figures has evolved from "what do we include and which numbers do we use?" as they were being prepared to a current "where did these numbers come from?" To permit easy comparison with the original literature, we have used the units as published. Conversion factors are supplied in the captions. The colors used for pool sizes (yellow), turnover rates (white), and residence times (cyan) are the same in all figures and are identified in the caption. The arrows associated with the fluxes denote the direction of the flux. Questions, corrections, updates, and suggestions should be addressed by e-mail to W. S. Reeburgh at reeburgh@uci.edu. These figures summarize the efforts of several groups. The carbon cycle figure resulted from discussions by participants at a 1993 Dahlem Conference on "The Role of Non-Living Organic Matter in the Global Carbon Cycle". The carbon figure was used as a template and set the level of detail used for the other figures. 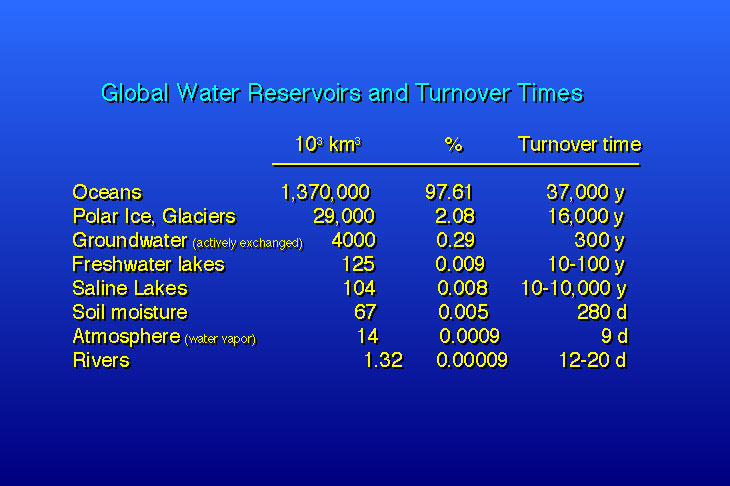 Review articles and tables from textbooks provided the information used in the methane and water figures. The other figures were produced and refined from 1993-1997 by graduate students in a core course offered by the newly-formed Department of Earth System Science at the University of California, Irvine. Data for the figures was assembled as homework; the figures were drafted after a thorough classroom discussion. The graduate students who contributed to this effort are: Huisheng Bian, Paul Burke, Julia Gaudinski, Bryan Hannegan, Adam Hirsch, Jennifer King, Caroline Masiello, Karena McKinney, Seth Olsen, Tibisay Perez, Shannon Regli, Joe Selzler, David Valentine, and Chris Walker. W. H. Schlesinger and M. O. Andreae provided helpful comments. Schlesinger, W. H., 1993, Biogeochemistry, an analysis of global change, Academic Press, San Diego. Murray, J. W., 1992, The Oceans, pp. 176-211. In: In: Global Biogeochemical Cycles, S. S. Butcher, R. J. Charlson, G. H. Orians & G. V. Wolfe, eds. ), Academic Press, San Diego. Hedges, J. I. 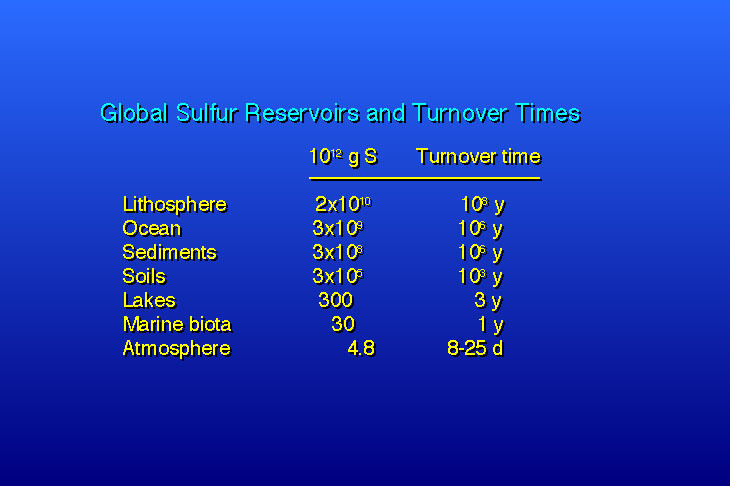 1992 Global biogeochemical cycles: progress and problems, Marine Chemistry 39:67-93. Eswaran, H., E. Van den Berg, and P. Reich, 1993, Organic carbon in soils of the world, Soil Sci. Soc. Am. J. 57:192-194. 1993. 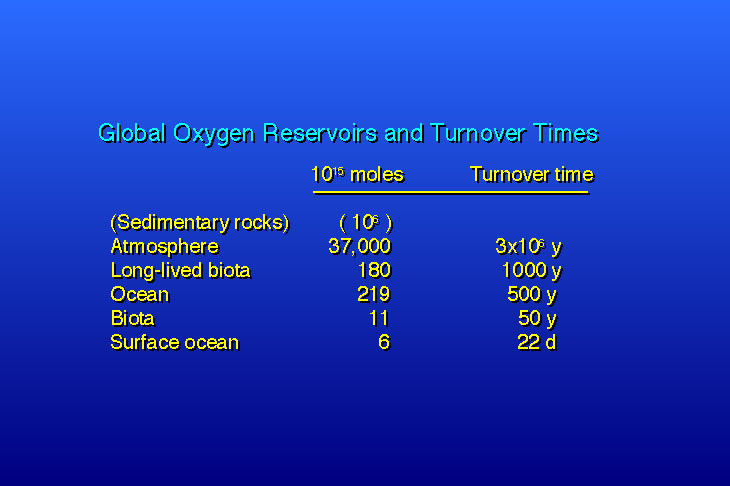 Siegenthaler, U. and J. L. Sarmiento, 1993, Atmospheric carbon dioxide and the ocean, Nature 365:119-125. Schimel, David S., B. H. Braswell, E. A. Holland, R. McKeown, D. S. Ojima, T. H. Painter, W. J. Parton, and A. R. Townshend, 1994, Climatic, edaphic and biotic controls over storage and turnover of carbon in soils. Global Biogeochem. Cycles, 8:279-293. Burns, R. C. and R. W. F. Hardy, 1975, Nitrogen fixation in bacteria and higher plants, Springer-Verlag, New York. Galloway, J. N., W. H. Schlesinger, H. Levy II, A, Michaels and J. L. Schnoor. 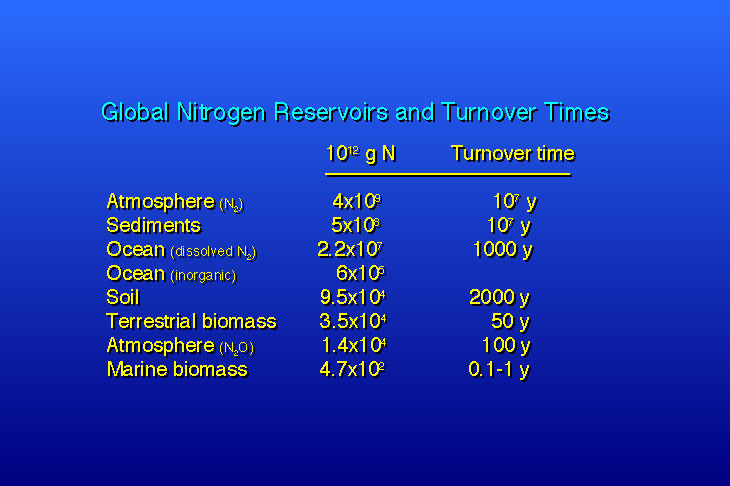 1995, Nitrogen fixation: Anthropogenic enhancement-environmental response. Global Biogeochem. Cycles 9:235-252. Jaffe, D. A., 1992, The Nitrogen Cycle. pp. 263-284. In: Global Biogeochemical Cycles, (S. S. Butcher, R. J. Charlson, G. H. Orians & G. V. Wolfe, eds. ), Academic Press, San Diego. McElroy, M. B., J. W. Elkins, S. C. Wofsy, and Y. L. Yung, 1976, Sources and sinks for atmospheric N20. Rev. Geo. Space Phys. 14:143-150. Schlesinger, W. H. and A. E. Hartley, 1992, A global budget for atmospheric NH3. Biogeochemistry, 15:191-211. Stedman, D. H. and R. E. Schetter, 1983 The global budget of atmospheric nitrogen species. In: "Trace Atmospheric Constituents" (S. E. Schwartz, ed. ), pp. 411-454. John Wiley, New York. Sšderlund, R. and B. H. Svensson, 1976, The global nitrogen cycle. Ecol. Bull. (Stockholm) 22:23-73. Keeling, R. F. , R. P. Najjar, M. L. Bender and P. P. Tans, 1993, What atmospheric oxygen measurements can tell us about the global carbon cycle. Global Biogeochem. Cycles 7:37-67. Jahnke, R. A. ,1992, The Phosphorus Cycle, pp. 301-315. In: Global Biogeochemical Cycles, (S. S. Butcher, R. J. Charlson, G. H. Orians & G. V. Wolfe, eds. ), Academic Press, San Diego. 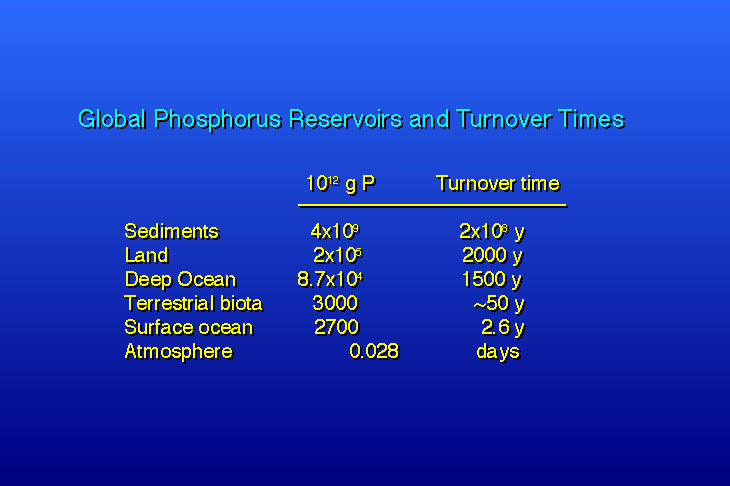 Berner, R. A. and J.-L. Rao, 1994, Phosphorus in sediments of the Amazon River and estuary: implications for the global flux of phosphorus to the sea, Geochim. Cosmochim. Acta 58(10):2333-2339. Meybeck, M. 1982. Carbon, nitrogen and phosphorus transport by world rivers. Amer. J. Sci. 292:421-454. Van Cappellen, P. and E. D. Ingall, 1996, Redox stabilization of the atmosphere and oceans by phosphorus-limited marine productivity. Science 271:493-496. Colman, A. S., F. T. Mackenzie, and H. D. Holland ,1997, Redox stabilization of the Atmosphere and Oceans and Marine Productivity, Science 275:406-407. Response by P. Van Cappelen and E. D. Ingall, Science 275:407-408. Andreae, M. O., 1990, Ocean-atmosphere interactions in the global biogeochemical sulfur cycle, Mar. Chem., 30, 1-29. Bates, T. S. B. K. Lamb, A. Guenther, J. Dignon, and R. E. Stoiber, 1992, Sulfur emission to the atmosphere from natural sources. J. Atm. Chem. 14:315-337. Charlson, R. J. , T. L. Anderson and R. E. McDuff, 1992, The sulfur cycle, pp. 285-300. In: Global Biogeochemical Cycles, S. S. Butcher, R. J. Charlson, G. H. Orians & G. V. Wolfe, eds. ), Academic Press, San Diego. TrŽguer, P., D. M. Nelson, A. J. 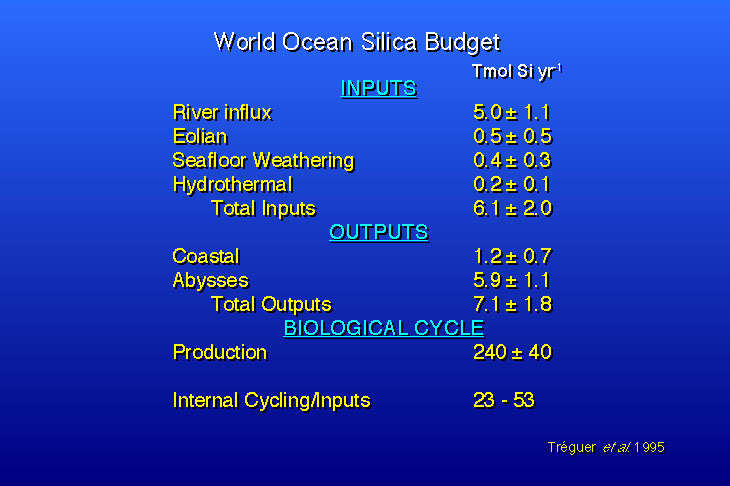 Van Benekom, D. J. Demaster, A. Leynaert, B. QuŽguiner, 1995, The Silica Balance in the World Ocean: A Reestimate. Science 268:375-379. Nelson, D. M., P. TrŽguer, M. A. Brzezinski, A. Leynaert, B. QuŽguiner, 1995, Production and dissolution of biuogenic silica in the ocean: Revised global estimates, comparison with regional data and relationship to biogenic sedimentation. Global Biogeoch em. Cycles 9:359-372. Ehhalt, D. H. 1974. The atmospheric cycle of methane. Tellus 26:58-70. Cicerone, R. J. and Oremland, R. S. 1988. Biogeochemical aspects of atmospheric methane. Global Biogeochem. Cycles 2:299-327. Fung, I., J. Lerner, J. Lerner, E. Matthews, M. Prather, L. P. Steele and P. J. Fraser 1991. Three-dimensional model synthesis of the global methane cycle. J. Geophys. Res. 96:13,033-13,065. Reeburgh, W. S., S. C. Whalen and M. J. Alperin 1993. The role of methylotrophy in the global methane budget. pp. 1-14. In J. C. Murrell and D. P. Kelly (eds.) Microbial Growth on C1 Compounds, Intercept, Andover, UK. Berner, E. K. and R. A. Berner (1996) Global Environment, Water Air and Geochemical Cycles, 376 pp., Prentice-Hall , Upper Sattle River, NJ. Bolin, B., and R. B. Cook (eds). (1983) The Major Biogeochemical Cycles and their Interactions, (SCOPE 21), 554 pp., Wiley, Chichester. Butcher Samuel S., Robert J. Charlson, Gordon H. Orians, and Gordon V. Wolfe (1992) Global Biogeochemical Cycles, 379 pp. Academic Press, San Diego. Ivanov, M. V. and Freney, J. R. (eds.) (1983) The Global Biogeochemical Sulfur Cycle, (SCOPE 19) 495 pp., Wiley, Chichester. Likens, G. E. (1981) Some Perspectives of the Major Biogeochemical Cycles, Scientific Committee on Problems of the Environment (SCOPE 17) 175 pp. Schlesinger, W. H. (1991) Biogeochemistry, An Analysis of Global Change,443 pp., Academic Press, San Diego. (2nd edition, 1997). Zepp, R. G. and Ch. Sonntag (eds.) (1995) The Role of Nonliving Organic Matter in the Earth's Carbon Cycle. Dahlem Workshop Reports, Environmental Sciences Research Report 16, 358 pp., Wiley, New York.